Three oversized faucet holes with one oversized accessory hole to the left and one oversized accessory hole to the right . Brookfield Undermount Cast Iron 33 Inch 5-Hole Double Bowl Kitchen Sink In White The classic Brookfield sink has been updated with a slimmer divider and expanded bowls that offer nearly 20 percent more workspace. 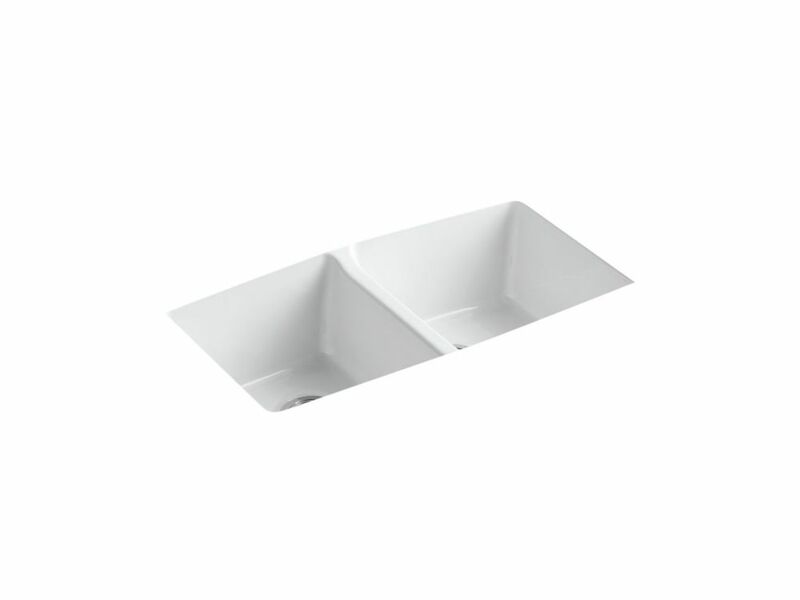 Two deep basins minimize splashing and provide ample capacity for cleaning pots and pans. Crafted from enameled cast iron, this sink resists chipping, cracking, or burning for years of beauty and reliable performance. Brookfield Undermount Cast Iron 33 Inch 5-Hole Double Bowl Kitchen Sink In White is rated 4.9 out of 5 by 15. Rated 5 out of 5 by KitcheKitchen1 from Looks great with new quartz counter top. Looks great with new quartz counter top. Rated 5 out of 5 by LindafromSouthwestFlorida from We like this sink very much so far. We were... We like this sink very much so far. We were surprised how deep it seems when mounted beneath the counter top but hopefully will adjust. Actually, when using a fish drainer, the dishes are less visible since the sink is so deep. Rated 5 out of 5 by Kathleen from I purchased this sink when I was putting in new... I purchased this sink when I was putting in new Countertops. I love the color and how deep it is. The installation was easy and it looks great with my Quartz and Cabinets. Rated 4 out of 5 by Kris from The sink looks just as we expected. The inside edges of the sink are rounded over, so you don't g... The sink looks just as we expected. The inside edges of the sink are rounded over, so you don't get a seamless look between sink and countertop because of the offset. Looks great.